Creating an opportunity in Current is the first step to gaining business from your customer. This guide walks through how to create an opportunity and what each of the fields on the opportunity screen are for. Keep in mind that only fields with an asterisk next to them are mandatory, so you don't need to fill out all of the fields to add your order. Go to your Opportunities > Opportunities and click the green create button at the top-right. At inquiry and draft stage, the subject is the only thing you’ll need to fill in on the opportunity. All other mandatory fields are pre-filled – perfect for getting inquiries logged quickly. As you learn more about the prospective event, edit the opportunity and fill in more details like the date, venue, and organization. The subject is the title of the event or job. This appears on any document layouts you print or download and you can use it to search. This is required. Great for searching and sorting, describe the opportunity with tags here. Hit enter to turn tags blue and lock them in. By default, Current will generate an opportunity number for you. If you've turned off automatic opportunity numbering in System Preferences, enter your number here. The customer reference field corresponds to “Your Reference” on most document layouts. It’s usually used for a purchase order number. It’s automatically pulled through to any invoices created. Who is the opportunity for? Start typing an organization and Current will auto-suggest from your People & Organizations. Create a new organization on the fly by hitting the green plus icon to the right of the organization box. If you’re creating an inquiry, use rating and revenue to record how important this inquiry is and how much you project to make from it. These are important for searching and sorting later. For example, you might like to know how many five star (important) inquiries you have on your system, or inquiries over $1000 were lost last month. Description is for internal notes. You’ll see this at the top of the opportunity page. It’s a space to record notes for your team. Shown below. 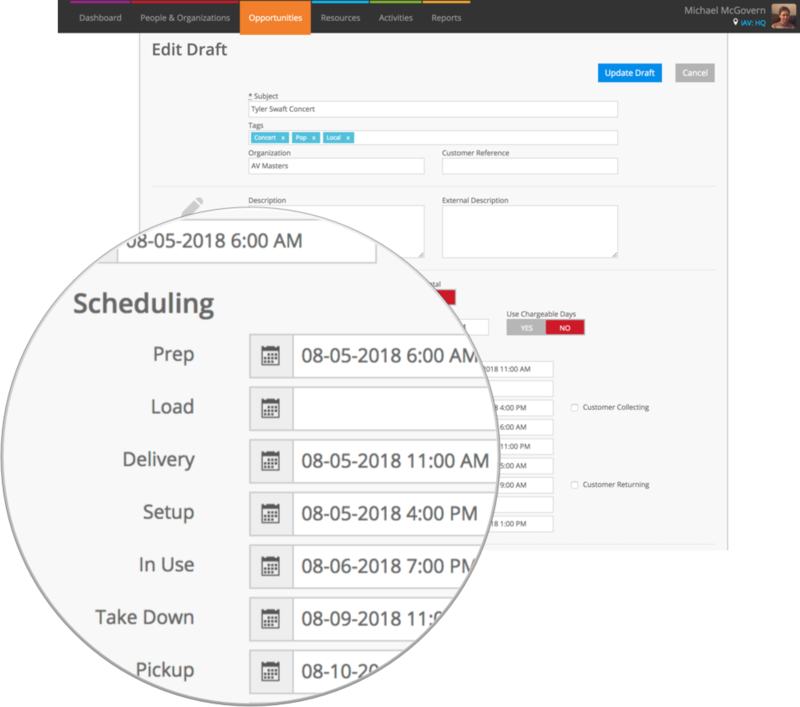 The extended scheduler has fields for start & end date, as well as prep & de-prep, load & unload, delivery & collection, setup & takedown, plus an ‘in use’ date. Use as many (or few!) of these fields as you need. You can switch between these in System Preferences. The date the opportunity was entered. It defaults to the date and time now, but you can change it if you need to. For quotations, specify when your quote expires. Set your default terms in System Preferences. Chargeable days is a way of telling Current RMS how many rental days to charge for, regardless of the start or end dates of an opportunity. Tick or toggle on customer collecting or customer returning to tell Current that your client will be picking up or dropping off the kit. How is rental charging calculated? Current uses the duration between the charging start & end dates. Current uses the start & end dates. These dates are like the parenthesis around your job; they’re not just the event dates, but also all the prep that goes on behind the scenes. All other dates in the scheduler should fall within the start & end dates you choose. At inquiry stage, you won’t get the full extended scheduler. Instead, you’ll only see the start and end date. The rest of the scheduler is available when you convert to a draft. Start typing in the “Venue” box to choose from one of the venues you’ve added to your People & Organizations. The venue you select will automatically populate the fields in the delivery address section. Add instructions for your driver, any specific access requirements, or any further information about the delivery in the delivery instructions field. This is printed on your delivery note. Use this section to change invoicing and administrative details. A project allows you to group multiple opportunities together. With a project, you can issue a project quotation to quote for multiple jobs at once, or a project invoice to bill for multiple opportunities in one go. Want to find out more? See: What is a project? Start typing a project name here and Current will auto-suggest from a list of your active projects. If you do not have a project set up yet, return to this opportunity and edit it to add it to a project at later point. Stores are a way of setting up multiple locations with different stock levels. The store defaults to the store you are working in right now, but you can change it here if you would like to use stock from another store. The owner is the person who is responsible for the opportunity. This is automatically set to the user account that created the opportunity. Change this here if you need to. If you have invoiced this opportunity already, toggle the “Invoiced” slider to YES. This will remove the option to invoice this opportunity from the Actions menu and will add an ‘invoiced’ label to the opportunity. On some document layouts surcharges are broken down for each line item and totaled at the bottom. Add participants to tell Current RMS who is involved with this opportunity. Participants can be user accounts, contacts, organizations, or venues you have set up in your Current RMS system. As you type, Current will auto-suggest matching results. At the bottom of the page, you’ll see any custom fields you’ve set up to show against an opportunity. When you’re done, click Create opportunity to create. 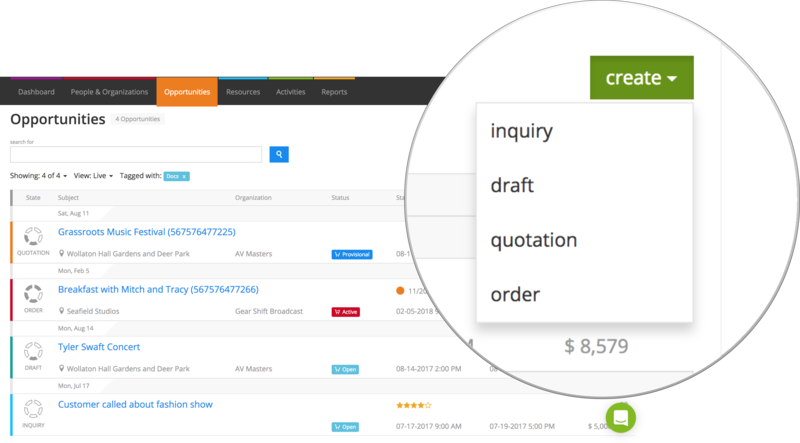 Current will bring you to a blank opportunity screen, ready to add products & services, log costs, generate documents, and book out stock.